Stacking antennas comes down to: combining two or even more than two antennas together so that they together form an Array. All the antennas in the Array are putting in the same amount of effort to achieve a stronger signal than the single individual. There are often stories told about how you should stack antennas, also often this is done by people who have never done this . By them self, in my experience it is not so straight forward as many people think. You have to keep in mind all different factors like: gain, the take-off angle, Front to back (side) etc. So be aware it is hardly the effort to start this. Unless you know what your doing and you have done serious thinking and calculation about the system keeping in mind all these individual factors. Often heard is: "stacking will provide you 3 dB"', more likely it is in the order of 2,7 dB when done CORRECT. Under perfect conditions we could reach 3 dB but in real live, this will not be the smart way or will not be possible. First of all you will have to deal with loss in connectors, cables etc. This will lower the Gain in first place. So only half an S-unit profit with a stack? as earlier mentioned 6dB was 1 S-unit. No, the same mysteries hangs around stacking as it does with a Quad it tends to be a bit more. We have had situations in the past in which the difference went up to 2 to 3 S-units. A few months ago with Eric on Backscatter there was a greater difference noticeable. Say we wanted the same gain as we are reaching in the stack But then with a single yagi. 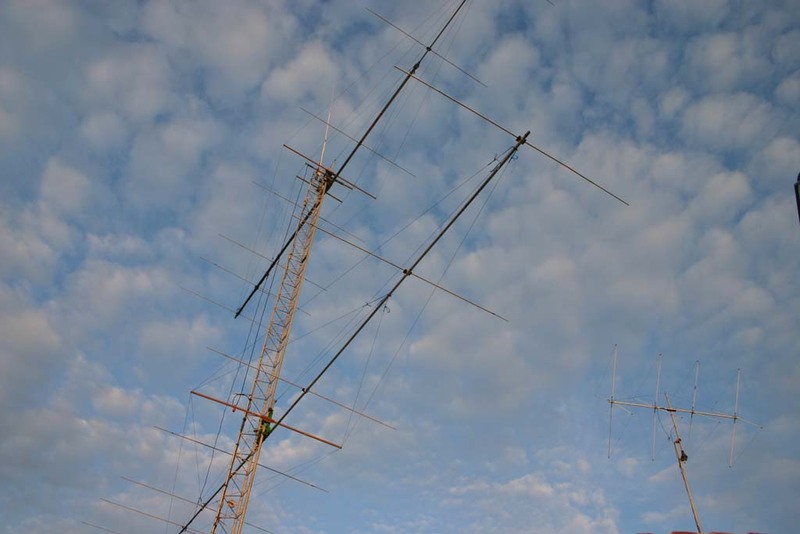 Imagine we already have a single yagi with a boom length of 20 meters (approx 9 elements yagi) and wanted to improve the system by 3 dB, you would have to double the boom length or.... get a stack to provide you the gain you wanted. This is a main reason for stacking, another advantage is you can make more use of your beam width which is handy for contesting. In big lines, there are two ways to stack antennas one is putting the antennas above each other, the second is putting the antennas next to each other. Since we produce an additional gain with stacking there must be somewhere we decrease the beam with of the array (that was where the gain came from). The gain reached in the stack was almost 3 dB this will resolve in dividing the beam width in half. When we stack the antennas above each other the gain is squeezed from the vertical beam with, so the vertical beam with is divided in two. The opposite happens when we place beams next to each other. You will achieve the same gain as in the other, but the gain then comes from somewhere else: the horizontal beam with so you will have to aim more carefully. This can cause for some trouble, you just might miss the station which is 20 degrees to the right form the main lob!. Most commonly used is the first solution ....above each other. There are probably two reasons for this. The mechanical problems are more easy to overcome, when compared to the side to side configuration. 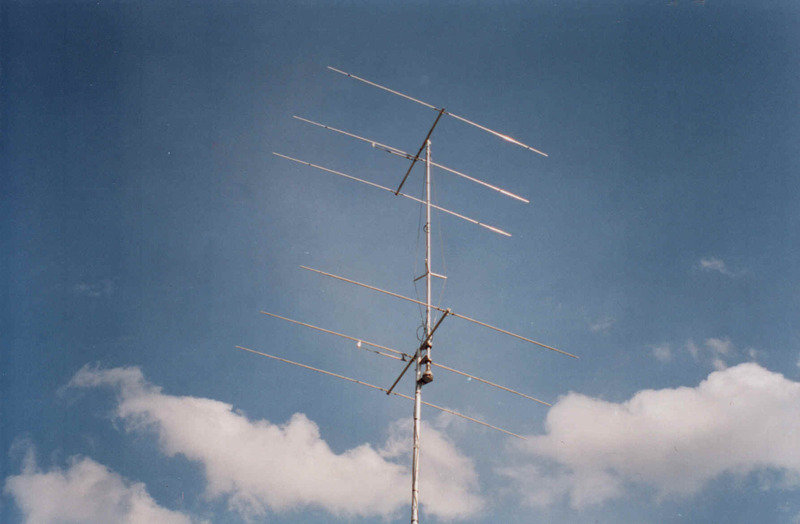 The signal still has the same horizontal beam with so even with great gain you can still aim the Yagi's rough. The big advantage lies to my opinion not in the < 3 dB gain but in the capability with an additional switch to switch between the take-off angle. What you see here is a stacked array which exist from 2 times a 5 elements yagi. These antennas are placed 10 and 20 meters above the ground. What is noticed: there is a big difference in the take-off angles (A/C), and it is for the one who wants to stack the challenge to control these angles until you have the right gain and the right angle which you were looking for. That's what its all about when it comes to stacking!. The question which rises: at what take-off angle is the DX we are looking for is coming through. We can understand that the further the DX is the lower the take-off angle will be.. You can figure this out by using programs like Yagi terrain analyzer from the ARRl handbook. 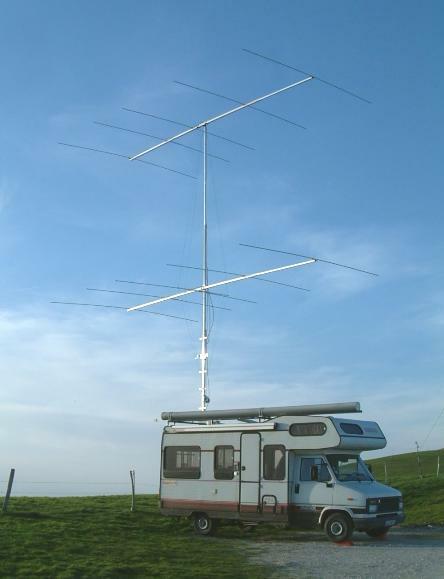 In my case I still need a few of those Pacific DXCC so the best solution for me would be: to place a high big single yagi and put my money more in the height of the antenna then the antenna it self. (according the ARRL the main angle under which pacific is coming through is around 2 degrees, Europe is around the 20 degrees for me and Africa about 10 degrees.) I've I was a contester and participated in a African contest a stack would be a better solution for me. A perfect example of the results which can be reached with low angle radiation was produced by 1SD019 Alex, who was able to work with his 3 elements Skypper at a mountain near the sea at a height of 70 meters some real DX stations, which could hardly be heard by the big guns around him. I hope so far this lead that you started thinking about the take-off angles and under which angle you want to have your main lob. To extend the Array to its full use, we need to switch between the Yagi's the upper for the far DX .the lower for every thing within the single hop (<2500 KM) and both for everything in between. There are extra cost coming around the corner, you have to make or buy a switch for the different antenna configurations is you want the full use of the stack. Such switches are available at ARRAY SOLUTIONS and COMTECH. and as said before you could build one yourself. 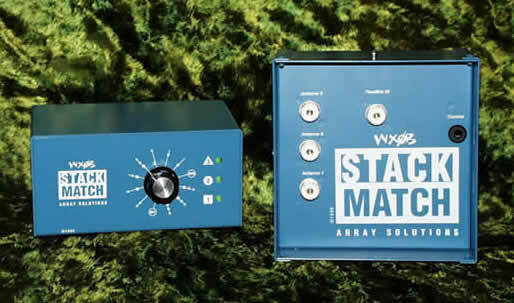 I use the one made by array solutions and it fits me fine, although I am confident that others will work equal well. Although there are great computer program mas, you must have a good starting point. With the following formula you will have the 2,7 dB gain, the side lobs are still low enough. This is the fast way to determine the distance and you will be satisfied with the results. 57 / -3dB beam with (H/V) = stacking distance in wavelengths. The only thing you need to know is the vertical or horizontal beam with of the single antenna. This can be provided by any good antenna manufacturer, often it is already found in their adds. What is important here is that the standard rule, which is often heard: put them 3/4 wavelength apart is thrown overboard. 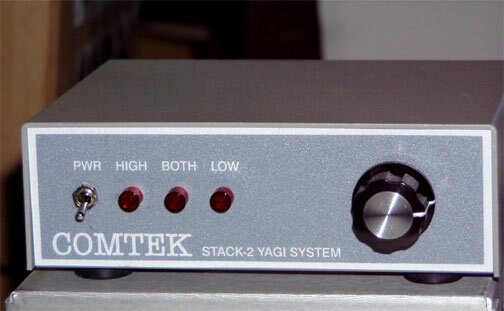 It probably comes from the old days with small yagi s that this resulted in some cases the maximum gain. And this is still passed on. There is thus the gain which is a plus, in life almost every plus has a downside this is the case with stacking as well. A few disadvantage will be seen when stacked. The front to back with a single yagi is better. The front to side with a single yagi is better. To keep this problem to a minimum the designer must in the early stage, when we design the array consider what is an escapable loss. Then redesign the ENTIRE system on the computer again. The single yagi which we were going to use in the stack is optimized for its single purpose. Now we are using two antennas so we have to re tune both antennas right until we reach maximum from the stack!. This is often forgotten. This will cause extra work time, but only imagine what for troubles this would bring without the computer! You would have to measure every small change you make to the system over and over again. The mentioned disadvantage is not solved completely by this, it is still down to a single beam, but the low values are getting better. The HDSP extra short versions in the chapter BEAMS is what I believe are good antennas for stacking, You can see these antennas as normal yagis where just one extra director is placed on the boom so the number of elements becomes 1 higher. With this you have great Front to Side figures as well as the Front to back and the SWR. A good friend of mine, once got the wrong advise by a well know antenna manufacturer. He didn't realize it until he came across the subject with a friend who told him and explained him why this was wrong. This only underlines..that it is a serious effort to stack Yagi's not everybody knows how it should be done. There is no secret, but you need to put effort in it. There are several ways to feed the system. When you learn a bit how to calculate with Ohms you could deliver any impedance you wanted. One is the system with the solution earlier mentioned in a form of a switch provided by a manufacturer or homemade. When this is the case you only have to apply two coax cable from the antenna towards the switch. These cables are 50 Ohms and have to be identical in length, this is important, identical in length! Take two 75 ohms cable make it a quarter wave length (1/4) long or on odd multiply of this (3/4 ,5/4 ,7/4) depending on the distance of the individual antennas. Remember there are already a few points where you loose in signal strength (the T-junction for example) so please do not play around with other connectors to make the cable "long enough" it will only result in loss! GOODLUCK STACKING THOSE BIG ANTS !! !